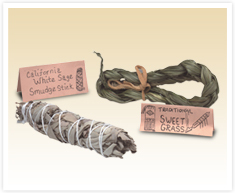 Smudge sticks have been used for generations in traditional native rituals of purification and the clearing away of negative energies. These smudge sticks are handmade by the family of Colleen Heminger-Cordell , a member of the Sisseton Wahpeton Sioux Tribe. The skills she uses in making her products were learned from her grandmother and Arikara Sioux great-grandmother. Growing, harvesting on the full moon in accordance with custom, and making these traditional products keep the Heminger-Cordell family busy and the native traditions alive.